Quick Ship Bleachers, 15 Foot 3 Row Aluminum Tip and Roll Bleacher, 246 lbs. This commercial 3 row bleacher is in stock and ready to ship! 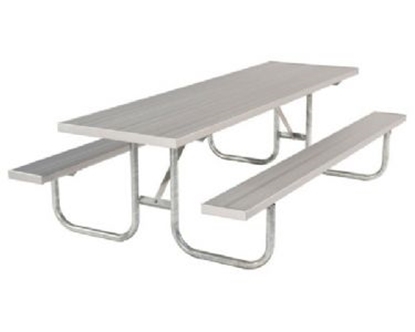 The 15 ft. length provides plenty of seating for school or sporting events. Constructed of commercial grade anodized aluminum for resistance to 24/7 exposure to the outdoors. Portable design with wheels for convenience. Features 2" x 12" anodized aluminum seat planks and 2" x 10" foot planks. • Quick Ships in 3 Business Days for quantity up to 4! Quick Ship ADA 8 Foot Rectangular Aluminum Picnic Table with Galvanized Frame, 138 lbs.